Showcase classic style with this elegant sofa. The sofa features exaggerated rolled arms that create a shapely silhouette, while the exposed wood arms, feet, and base highlight linear carvings that allude to Greek and Roman architecture. Two pillows and plush seat and back cushions complete the spacious sofa for a classic, yet comfortable seating option. The 8400 Traditional Sofa with Exposed Wood Rolled Arms by Affordable Furniture at Wilcox Furniture in the Corpus Christi, Kingsville, Calallen, Texas area. Product availability may vary. Contact us for the most current availability on this product. 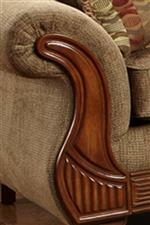 Showcase warm, traditional style with this seating group. Each option features exposed wood arms with unique pilaster and reed detailing that alludes to classic Greek and Roman architecture. Rolled arms balance the linear carvings for a shapely silhouette, while plush seat and back cushions promise modern comfort. The 8400 collection is a great option if you are looking for Traditional furniture in the Corpus Christi, Kingsville, Calallen, Texas area. Browse other items in the 8400 collection from Wilcox Furniture in the Corpus Christi, Kingsville, Calallen, Texas area.